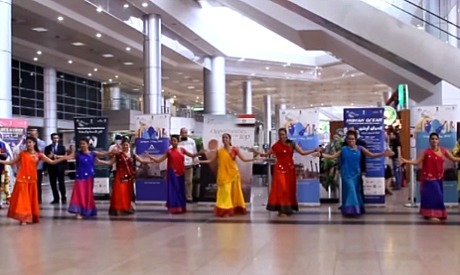 A group of Indian dancers who just arrived to participate in the fourth edition of India by the Nile festival performed a Bollywood dance flashmob at Cairo International Airport on Friday. The troupe performed small fragments of Bollywood show Love Story, the full version of which will be staged at the Cairo Opera House and Alexandria Opera House, during the festival. The India by the Nile festival will take place from 23 April to 7 May. This is not the first time for the dancers to stage a flashmob upon their arrival to Cairo. Similar practice took place in previous editions of the festival, always surprising the people gathered at Cairo airport with a dance filled with dynamism and colour. "India and Egypt share a very special bond, a friendship which has a very long history," Sanjay Bhattacharyya, ambassador of India to Egypt, told Ahram Online as he welcomed the Indian troupe at the airport. He added that it is important to always refresh the bond between the two countries and India by the Nile festival is one of the great opportunities to do so. "We are all very excited to be here. The troupe has just arrived, while the main events [of India by the Nile] will spread for two weeks," Ranu Bhattacharya, the wife of India ambassador, who also welcomed the Indian troupe at the Cairo Airport, commented to Ahram Online. The fourth edition of India by the Nile festival is back this month for the fourth year in a row, bringing contemporary and classical Indian arts, wellbeing techniques, food and other insights into Indian culture to an Egyptian audience. This year the festival will take place across six cities- Cairo, Alexandria, Ismailiya, Port Said, Sharm El-Sheikh and Beni Suef. The programme includes a Bollywood Love Story musical, Bollywood dance workshop, Oddisi classical dance performance, Indian Ocean rock and fusion band, food fiesta, wellbeing and meditation activities, among several other attractions.